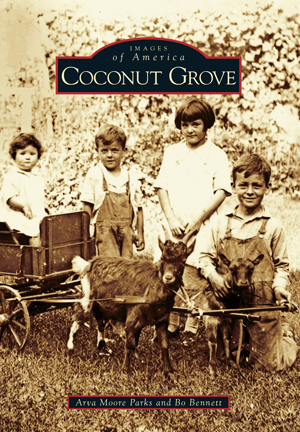 By the time the City of Miami was born in 1896, Coconut Grove was already a well-defined community with a variety of interesting residents who liked what they found and were willing to fight to keep it that way. Images of America: Coconut Grove tells their story, from the native people who called it home to the Bahamians and sophisticated settlers who together shaped its special character. Despite hurricanes, booms, busts, and those who would change it, Coconut Grove remains uniquely itself. Award-winning historian Arva Moore Parks has a special affinity for Coconut Grove. She wrote her master's thesis on its history, and her first book, the Forgotten Frontier, highlighted the photographic work of Ralph Munroe, builder of “the Barnacle.” Working to preserve his historic home launched her passion for historic preservation. Since then, she has authored, coauthored, or contributed to more than 30 books and documentaries on South Florida history and remains a tireless preservationist. Bo Bennett is an author, researcher, and certified paralegal. She wrote Images of America: Lexington, coauthored four other titles with Dr. Nan DeVincent-Hayes, and researched two additional works. Bo was a resident of Miami from 1965 until the early 1990s, and she will always call it home.